The bridal clutch is one of the most classic wedding pieces (second only to the bouquet)...and it can be quite practical. What better place to store your wedding day survival kit than a dainty and delicately designed little clutch? I think you see where I am headed...it's like the mini version of that 30lb bag that you sling over your shoulder everyday with the necessities that get you through daily life. The clutch serves the same purpose! There are certain items of necessity the day of your wedding and carrying them in your 30lb bag is probably NOT the fashion statement you want to make. I would think carefully about what you do have in your clutch...I'm an old fashioned gal, and many in your wedding may be put off if your cell phone rings as you are saying "I Do". 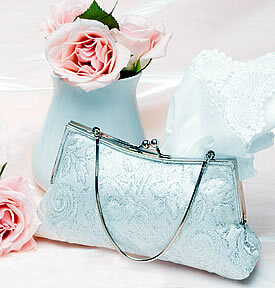 Need some help finding the perfect bridal clutch/purse? Whether you want ELEGANT Bridal Clutch, VINTAGE Bridal Clutch or SIMPLE Bridal Clutch, be sure to check out the styles that Where Brides Go has to offer. Please follow us on Facebook, Twitter and Pinterest for more bridal accessories and tips on planning your perfect wedding day.